Fairfax, CA, May19, 2017 – Today Ross Valley Charter (RVC) is releasing its first 2017-18 student registration report. For the past 6 weeks, RVC has been registering students with its new SchoolMint cloud based registration system and is nearly complete with the first phase of its ongoing enrollment process. Currently, 133 students have registered with Ross Valley Charter for the 2017-18 school year. Seven more are in the process of registering, for a total of 140 students. 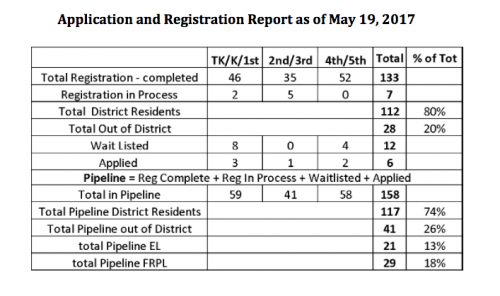 Additionally, there are 12 students on a wait list, and RVC has recently received 6 new applications for a current total of 158 students in the school’s current application/registration “Pipeline.” These numbers are shown in detail in the table below. At six classes, RVC will be full with an enrollment of 148 students. If RVC instead opens with seven classes, it would accommodate up to 172 students. In either case, there are currently available seats only in the two 2nd/3rd grade classes, which will be full at 24 each. Both the 6 and 7 class options generate an operating budget surplus in RVC’s first year and result in end of year reserves over 6%. These operating surpluses include an allocation for the Prop 39 regulation penalties that RVC estimates because its in-district attendance may well fall below its estimates. RVC continues to receive an average of 10 applications per month, and therefore believes it is likely to fill 7 classrooms by the fall, so that continues to be our operating assumption. If RVC opens with 7 classes, the seventh class will be a TK/K/1st grade class. Currently, 48 students have either registered or have begun the registration process for TK/K/1st grade. Eleven additional students are on the TK/K/1st grade waitlist or have recently applied for those grades. Current plans are to hire another classroom teacher and admit up to 24 additional TK/K/1st grade students when there are at least 12 TK/K/1st grade students on a waitlist who are ready to register. Until that happens, RVC is only admitting enough TK/K/1st grade students to fill two classes at 24 students per class. Scores of parents, who have withdrawn their application over the last few months, have told us they are still very interested in our school but felt they were not quite ready to register, mostly because they were unsure if RVC was really going to open. Once RVC has an operating school with classrooms to visit at 101 Glen Drive starting on August 23rd, we expect in district enrollment to increase during the 2017-18 school year and following years. RVC is currently exceeding its petition diversity goals of 6% English Learners (EL) and 12% for Free and Reduced Price Lunch (FRPL). Currently in our overall pipeline, 13% of our students are EL and 18% are FRPL. It has been a strong focus of RVC’s outreach program to market to a diverse community, and our current numbers show that these considerable efforts have been successful. RVC has signed contracts with five of the multi-age classroom petitioning teachers, all of whom have resigned from the Ross Valley School District, and expects to sign the sixth. RVC has hired a school director with a public school administrative credential and experience at an award-winning San Francisco public school. RVC has also hired an office manager and a special education teacher, is interviewing for the seventh classroom teacher, and is accepting applications for other part-time positions. In the next month RVC’s Board will consider a budget with 172 students, with a contingency budget of 148 in case RVC decides to have only 6 classrooms. RVC will be notifying the schools our students are currently attending on or before June 15, 2017 to ask for student records. The Application and Registration Report below is a snapshot of our current enrollment situation. This is a new report from our SchoolMint registration system and we will use this format going forward and present updates at our monthly board meetings. Ross Valley Charter School (RVC) will feature multi-age classes with an emphasis on project-based learning and integration of art, music and performances into all subjects. The school will also provide Spanish language classes for all students at all grade levels as part of the regular school day. RVC was authorized in January 2016 by the California State Board of Education. It is opening August 23, 2017 at 101 Glen Drive, Fairfax, CA. Charter schools are free, public schools open to all students, just like district-run schools. The State Legislature authorized the creation of charter schools in order to promote choice, innovation, and competition. Marin County is far behind in terms of providing public school choices to local families. Statewide and in the Bay Area, 8% of California’s public school students are enrolled in charter schools today. Only 1.5% of Marin’s K-12 school students currently attend charter schools.